Lake Näkten is located not too far from Lake Storsjön (The Great Lake), and today I scouted it for good locations. For good places to take pictures and for little villages that might be of interest some day if I buy a house. 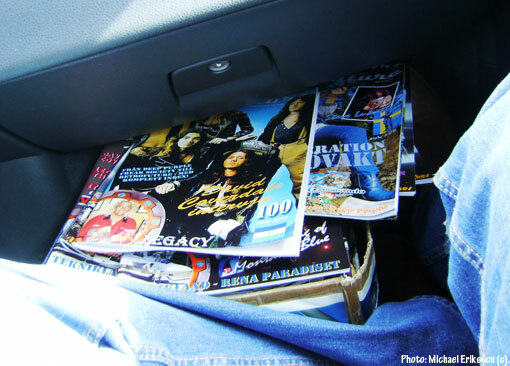 I also handed out 100 magazines along the way, to locals in the area. My friend Seth and I made a good trip out of it, and it is always interesting to see new places. I only took a few snapshots today, but I did film this trip. Roughly two thirds of RETROFUTURE 6 (Western edition) has been completed and we only need to spend another hour on the project to have the magazine ready on a CD to be shipped to the printers. This page goes with the second part of the Tornado Blaze novel, and I did preview this image (the original) on this blog not long ago. I just realised that Trinkelbonker has been around for a year as of today, August 14. So to celebrate this I decided to mention it here and to add yet another image from the Western Archive (pretty good excuse!) 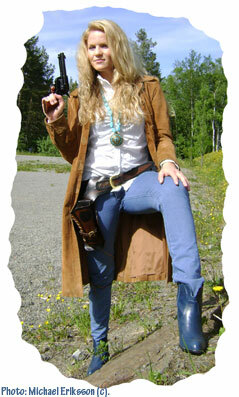 – Nina posing as Montana Blue (back in June 2010). In fact, this was one of the very first shots I took that day, the real posing started within seconds after this very moment captured here. Trinkelbonker has posted stuff nearly on a daily basis ever since the beginning. Stan Lynde, creator of Rick O´Shay, passed away on August 6. Sad news indeed. I grew up with Rick O´Shay, he was published in our comic book Fantomen (The Phantom) and also in his own albums. This is one such publication, printed in 1986 (the same publisher, Alvglans, produced three albums in all). Rick´s buddy, Hipshot Percussion, grace this particular cover. Stan Lynde was a genius. 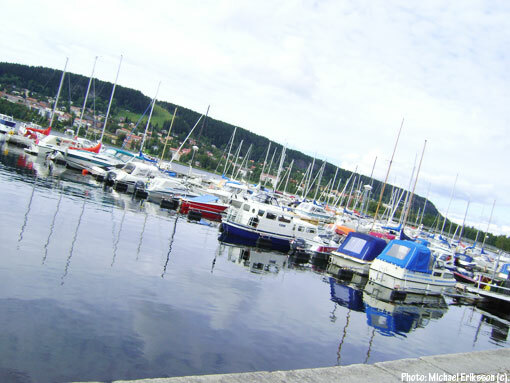 Took this snapshot down in the harbor of Östersund a couple of hours ago, and what a beautiful place it is. The island of Frösön rises out of the water in the background, it has four bridges to the mainland. This spot has a harbor restaurant on it, so that is not a bad view if you choose to have dinner and refreshments down there. This harbor has a lot of character. Östersund is a nice little city, I´m glad I live in these parts. 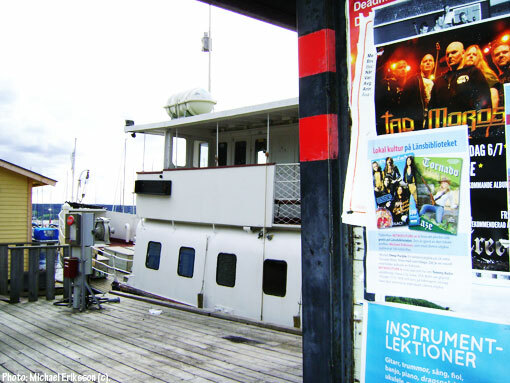 I managed to find some pretty good locations for some of the RETROFUTURE flyers (mentioned earlier this morning on this blog) around Östersund today, and about half of them are now in public view as we speak. Some of them outdoors, like this one down at the harbor, and some in places of business (a supermarket, a coffée shop, a museum). I will take care of the local universities and high schools when they open for the fall season. The holiday season is coming to an end within a couple of weeks and the town will buzz with nenewed enthusiasm then. Plenty of tourists about, but a big chunk of the local population are elsewhere right now. Looking forward to the next few months of activities. 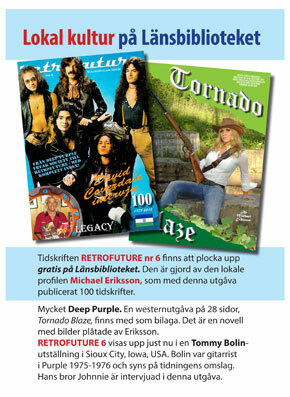 As you know, free copies of RETROFUTURE 6 (Purple edition) and Tornado Blaze can be picked up by the public at the County Library here in Östersund and my good friend Thomas Drugg at the library (a good fellow that has also contributed some great articles to previous magazines) has created a flyer about this that I will start to distribute around town today. Also, the schools will open again soon, so that will be a good thing (I´m thinking high schools and universities). RETROFUTURE magazine issue 6 can be picked up for free at the County Library. It is created by local profile Michael Eriksson, this being his 100th publication. Loads of Deep Purple. 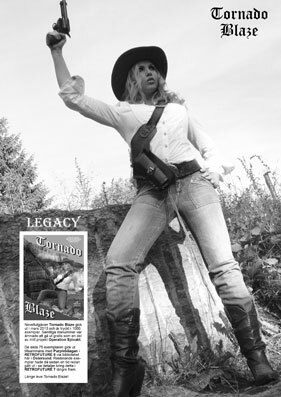 A 28 page western edition, Tornado Blaze, has been included as a bonus. This is a novel with photographs by Eriksson. RETROFUTURE 6 is currently on display at a Tommy Bolin Exhibition in Sioux City, Iowa, USA. Bolin was playing guitar in Deep Purple in 1975-1976 and can be seen on the cover. His brother Johnnie is being interviewed in the magazine.